Chef's JP McMahon and Ross Lewis. 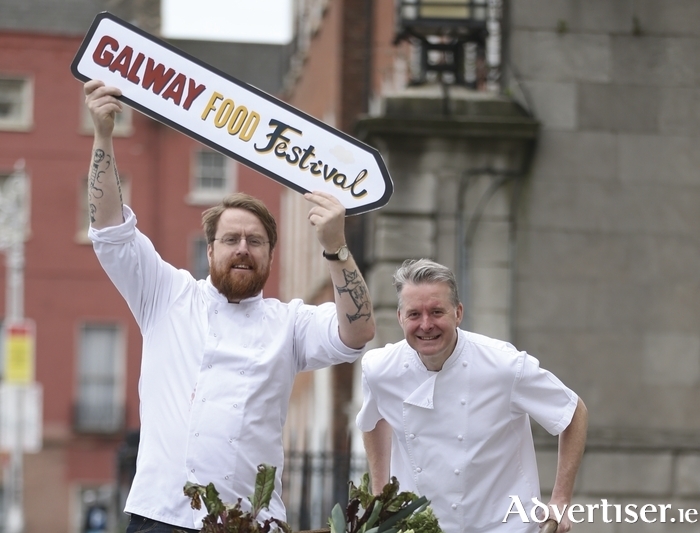 There is just one week to go until the 2016 Galway Food Festival which will celebrate '100 Years of Irish Food' and see leading Galway, national, and international chefs give live cookery demonstrations. The festival, which runs from Thursday March 24 to Monday 28, will be opened by Ross Lewis, the Michelin Star chef of Dublin’s Chapter One Restaurant, on the Thursday night. His ‘Tale from an Irish Food Story’, the first of the live cooking demonstrations, takes place at the Global Food Village, Spanish Arch, on Friday 25 at 11am. The festival theme is '100 Years of Irish Food' and runs in tandem with Ireland’s 1916 Centenary Commemoration Programme. On Good Friday there will be demonstrations at the Global Food Village with Michelle Crehan-Kavanagh, Kitchen Café, Galway, at 12 noon; Martin Bealin at 1pm; Wade Murphy of 1826 Adare restaurant, presenting ‘Using Traditional Techniques in the Modern Home’ at 2pm; Gavin McDonagh of Brioche Dublin at 3pm; and Paul McDonald of Bastion, Kinsale, with ‘The Leg in the Egg all things Duck’, at 4pm, exploring Ireland’s culinary advancements over the last 100 years. On Saturday 26, food festival chair JP McMahon will demonstrate cooking with traditional Irish lamb at 1pm; while Brendan Keane, head chef of The King's Head, will present 'Noshtalgia Classics from the 1980s' at 3pm. Expect to also hear some classic hits from the era. At 4pm, Joe Flaherty of Brasserie on the Corner will satisfy the sweet tooth cravings with 'Sweet Moments of the 90s'. Easter Sunday will see the Twelve Hotel present an exploration of the age old techniques of ‘Cooking with Seaweed’ at 12pm. Alan McArdle, award winning head chef at the Glenlo Abbey Hotel, will marry old and new Irish fare at 1pm with ‘Traditional Irish cuisine with a Contemporary Twist’ demonstration. David O’Donnell, head chef of the Ardilaun Hotel will present ‘A Taste of Aran’ at 2pm. Ultan Cooke, head chef at Ballynahich Castle will present his ‘Pike Quenelles and Langoustine Sauce’ demonstration at 4pm. Other events to look forward to include ‘A Taste of Spain’, Cava Bodega’s Good Friday Tapas Feast at 5pm; Il Viccolo’s Italian ‘Chichetti at Home’ on Saturday 26 at 12 noon and Wa Café’s Japanase demonstration ‘Cooking with Sake’ at 5pm. On Easter Sunday at 11am, Kai presents ‘Kai Brunch Classics with the Ultimate Kai Bruch Cocktail’, and at 3pm there is the House Hotel’s Kevin Hynes’ ‘Simple Cheats on how to Prepare Fabulous Party Food’. The final demonstration is on Easter Sunday, with Polish chef Bardo Ladnie’s ‘Then and Now, Producing Cheese Curds’ at 5pm. There will also be food tours, foraging expeditions around Galway city and county, pop-up dinner’s at Galway restaurants, talks on the past, present and future of Irish food, sustainability, and organic farming, as well as numerous free events. For more information see www.galwayfoodfestival.com or follow Twitter and Facebook.